There is no shortage of options to choose from when it comes to selecting a ferry from Langkawi Island to Thailand. There are 2 ferry companies with a combined offering of 11 Ferry Routes connecting Langkawi (Kuah Jetty) to Koh Lipe (Bundhaya Beach). 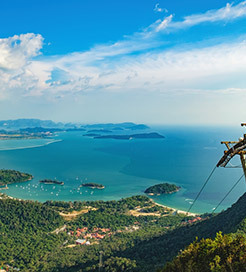 The fastest route between Langkawi Island and Thailand is Langkawi (Kuah Jetty) to Koh Lipe (Bundhaya Beach) with a crossing duration of around 30 minutes. With so many routes on offer we make it simple by comparing all similar routes in one search so you can quickly find what you are looking for. 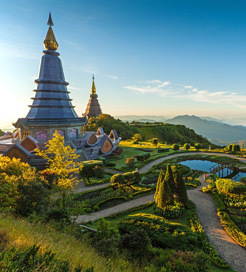 Thailand is a Southeast Asian country, bordering Myanmar, Laos, Cambodia and Malaysia, clockwise from northwest to south. Serving up a cuisine as mouth-watering as the paradisiacal island scenery, Thailand is one of the most well-rounded tourist destinations on earth. A mountainous north gives way to the southern, Kra Isthmus on the Malay Peninsula, a journey taking you past hundreds of opulent Buddhist temples, through dense jungles and along coastal roads upon limestone cliffs. You can also jaunt offshore to some of the world’s finest snorkelling spots, or for whale shark diving in the Gulf of Thailand. PADI licences can be obtained in the majority of resort towns: one of the most popular tourist pursuits, alongside cooking classes. Bangkok, the capital, is made of an eclectic mix of imposing business buildings and world famous night clubs with traditional canal boats and streets lined with food stalls. The city’s finest showpiece, Wat Phra Kaew, is the most sacred temple in Thailand, featuring the iconic Emerald Buddha statue inside. Ferry travel is widespread in Thailand, and the most efficient way of hopping between the archipelagos. Given the popularity of the Thai islands, the ferry services are fast and frequent, operated by a wealth of reputable companies. You can also sail from Langkawi, in Malaysia, to Koh Lipe in just ninety minutes.